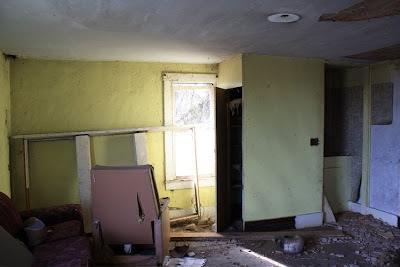 As we were finishing up our day of work on Monday at the cabin, the Mister and I decided that we are finally at the stage in the project that, if we brought a total stranger to see the place, they would no longer think we were crazy! 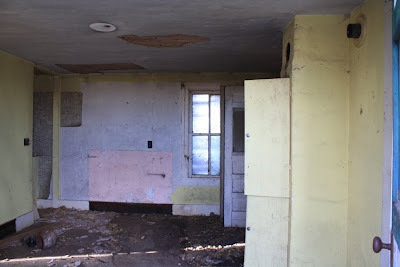 Here are a couple of "before" pictures of the outside of the cabin that were taken on one of our work days last winter. And now, Ta Da! Here it is with it's brand new roof. No more worrying whenever it rains (and that has been a lot so far this summer, which is a good thing!) that there is water damage going on. This is a close-up that shows the last little bit of the old porch is gone - the line of rolled roofing that was still attached above the door. Have you ever known one of those kind of people who come up with real good ideas, but then enlists family members, friends, acquaintances, and even total strangers for help in making it happen? Unfortunately for everyone else, I am that person. My brother, who doesn't particularly like heights spent all day on Sunday straddling the peak of a very steep roof to put up all the tin. And that was after he had spent all day Saturday on site, alone, cutting the tin to length. Of course, it goes without saying that the Mister just shakes his head and rolls up his sleeves whenever I come up with a new crazy idea. Here are some before and after shots of the interior. This is the attic with all of the fiber wall board hanging down, and mountains of mouse-pee-soaked mattress stuffing all over the floor. Here it is as it looks now. Don't be a smart-aleck and point out that the floor is only half scrubbed. I know it, and am not looking forward to finishing the job. It gets hot up there real fast in the morning! You should also notice that the Mister got the dividing wall torn down. And now for the downstairs. I tried to remember the angles that I had taken the original pictures from, and think I did a pretty good job of recreating the shots. A few things to take note of are the barn swallow nest above the door, and the ancient linoleum under all of the debris on the floor. No, it isn't waxed, the floor was just still wet when I took the picture! The Mister rigged up a 50-gallon barrel in the back of his new Ford F-150 truck (can you tell he's proud of it?) to haul water up to scrub with, and it took all of it Monday. This is the north room. 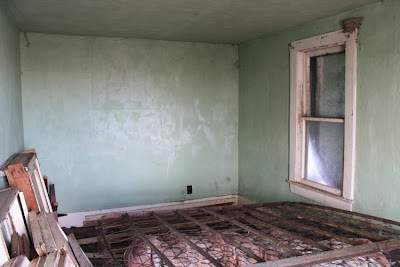 The bedroom which I believe my father was born in, as I know he was born on the ranch, and this is the obvious choice. Again note the barn swallow nest. What isn't obvious in this picture is that the raccoons who lived here for awhile made thier potty in the corner. Can you say ewwww? I did, many times, as I scooped it out. Almost clean enough to live in... all right, not quite, but close. Another before and after shot of the main room downstairs. And again, another. Note the bundles of fresh sage hanging on the wall. There is no shortage of sage in the sandhills, so we picked several bundles and placed them throughout the house for purification, and because it smells good. On the next trip up, we'll burn the dried sage in a brazier and hang more fresh. Oh yes, I didn't forget the dove nest in the window. On Sunday I noticed that it was no longer eggs the mama was sitting on, but babies. I was really worried that all of our shenanigans might scare her off for good, but she kept coming back. This picture was taken Monday afternoon, and the babies are enjoying the sunshine. Doves certainly get prettier as they grow up. 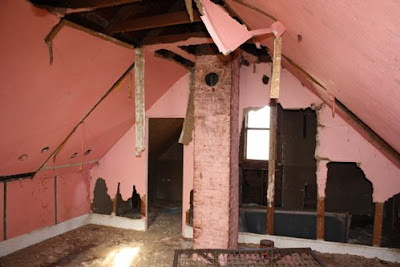 Do you have a renovation project in mind? An historic property that needs some tender loving care? My advice to you is to get going on it. If we had started this project ten years ago, it would be done by now and we could be enjoying it. That said, ten years from now we'll appreciate that we got it done. As I was scrubbing the floor, feeling like I would have rather been anywhere else but there, tired of the project and wishing I had never even considered it, I got to thinking about how fortunate I am to have the project to do. 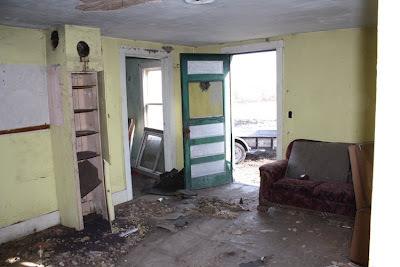 After all, the homestead had been abandoned for nearly 50 years. 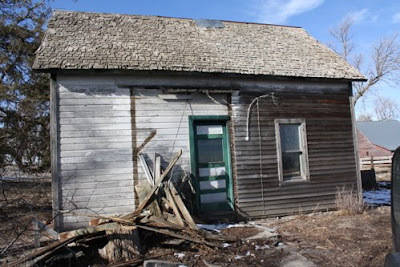 It could have been in so much worse shape, but many people committed small acts (and some not so small, like tinning the roof of the barn), that held it all together. 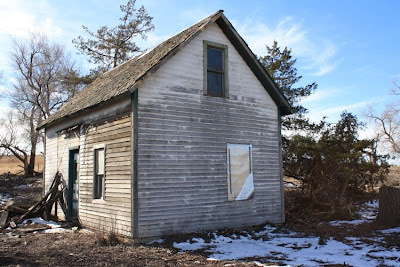 My cousins, who have rented the pasture land for years checked on the place periodically, covering the windows, making sure the door was shut, covering the hole in the roof when the chimney fell down. I wonder what my dad would think of the project. Probably he would still think we were crazy, that there's a lot more important stuff to spend our time on. But he would be the first to tell anyone that I didn't listen to his advice very often! After all, you can tell a Seifer, you just can't tell 'em much! So that's where it stands today. Thanks for stopping by. Coffee on a camp stove next time.